In this blast, three exhibitions speak to the topic of journey, whether it be directly or indirectly. The artwork in these shows stands as the "in-between"--now it's up to you to see where they've come from and where they're headed. Also, don't forget to check out our new blog on the artscope website. It is equipped with updated headlines and rotating featured content -- a great way to stay connected to art and culture news in between artscope issues and email blasts! Online advertising is now also available on the blog as well. As always, you can send information on upcoming exhibitions and performance events for both the magazine and these e-mail blasts to info@artscopemagazine.com; reach us to advertise. 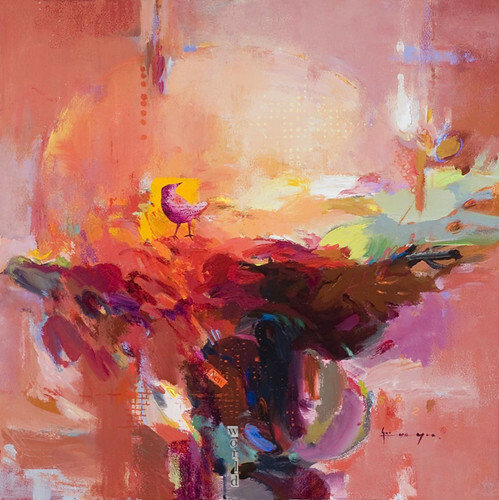 Bird Dream by Soo Rye Yoo, acrylic. What we see and how we see it has so much to do with who we are. Our perceptions, reflections, and visions are shaped by the avenues we come from and the ideas that come from us. Translating these views into expressions is not always easy and some individuals dedicate their entire lives to recording their journeys. Artists are among these remarkable individuals that take this task upon themselves, and the nine contemporary artists in this exhibition show us why. Visions and Reflections: Diverse Journeys helps us understand why artists do what they do. What helps them is the idea that their journey is never over-they are constantly creating. This means they can record their stories and experiences as they happen, eliminating any pressure to summarize or conclude. You can't put an end to continuity, which is exactly what the journey of an artist is. The featured artists in this exhibition are: Maureen Ahern, Barbara Danser, Marsha Hewitt, Charles P. Goodwin, Patrick McCay, James Rappa, Gail Smuda, James K. Wolcott, and Soo Rye Yoo. These talented individuals are accomplished, successful, and worldly, and their artwork serves as proof of this. The paintings of Maureen Ahern are vibrant and help viewers realize how perceptions of reality are constantly changing. Barbara Danser's bronze sculptures focus on the rapture of life in nature, honing in on its cyclic features. Marsha Hewitt reveals her global visions with her encaustics that question the survival of the endangered African wildlife and the indigenous Maasai culture. The layered paintings of Charles P. Goodwin explore paint for all it's worth: its surface, color, texture, physicality, and mass. James Rappa invites viewers to consider their own visions and reflections through the abstract forms of his mixed media works on paper and sculptures in steel and stone. Gail Smuda is a book artist whose works investigate her present-day existence in conjunction with the lives of women in the past. The subtle similarities help drive her motivation. James K. Wolcott's fabric paintings transform a variety of natural and plastic woven fabrics into richly layered surfaces. The paintings of Soo Rye Yoo, whose work is featured above, stand as metaphors for the stories of nature. She has said, "It is my goal to paint life: soft, warm, peaceful images in a way that soothe the viewer's mind and body." Visions and Reflections: Diverse Journeys opens on Friday, October 28th and will be on view through Saturday, December 24th at Mill Brook Gallery & Sculpture Garden. A reception is scheduled for Sunday, October 30th from 3-6pm. Pamela R. Tarbell is the curator for this exhibition. Fenway Studios artist, Glenda Tall (center), welcomes guests to her studio. offer their unique perspectives using encaustics. The result is a show that is beautiful, complex, and multifaceted. 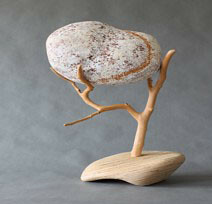 Sculpture Scoop is a sale of sculpture, drawings and jewelry by all 36 members of the gallery. With the majority of the works priced under $300, this is a unique opportunity to own art created by some of the Boston area's premier sculptors. Don't miss Scott Cunningham: Steel, Paint and Ink, on exhibit through November 14, 2011. 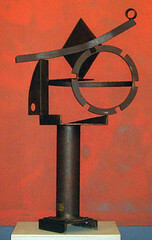 His sculpture "seeks to achieve a floating spacial illusion married to solid structural reality." In connection with the large-scale outdoor sculpture exhibit, BIG ART2. 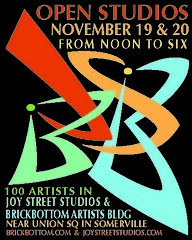 Partial exhibit closure on November 1. 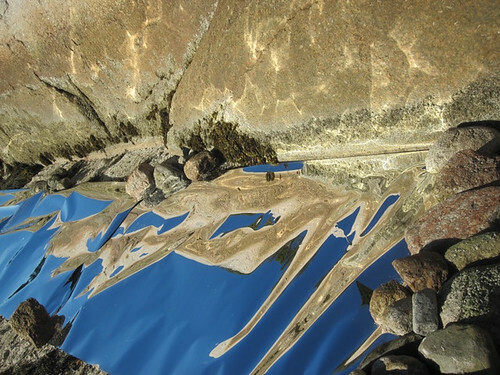 Blue Reflection by Luanne E Witkowski, unaltered photograph. As much emphasis as we put on our journeys in life, we often let them distract us from the simpler things. Have you ever wondered what is lost to commotion, to responsibility, to society? Artist Luanne E Witkowski has dedicated her most recent solo exhibition to finding what goes awry on our journeys. In Lost + Found, Witkowski uses the contagious energy of the shore and woodlands of outer Cape Cod, Maine and Nova Scotia to help her translate experience into visual language. She records documentary video and photography of environmental installations in her "research sketchbook," allowing her to bring nature into the studio for the creation of her multi-media works in paintings, photography, and video projection. With landscape and experience as her roots, Witkowski makes sure that nature will always have a place in our busy world. This promise of natural permanency can be found in each contemplative piece this artist creates. She gives us hope and reassurance by finding things we never even knew we lost. Lost + Found is showing at Kingston Gallery from Wednesday, November 2nd through Sunday, November 27th. 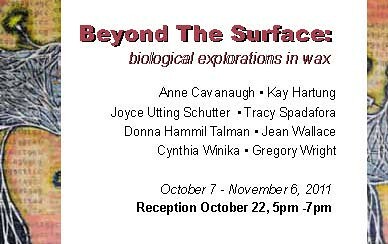 The public is invited to attend an opening reception on Friday, November 4th from 5:30-8pm. This will be Witkowski's third solo exhibition at the gallery, where she is a committed member. She is a member of several artist organizations, including the United South End Artists, Mission Hill Artist Collective, and the Provincetown Art Association & Museum. She is also Communication Design Studio Manager at Massachusetts College of Art and Design, faculty at UMass/Boston's Critical & Creative Thinking Graduate & China Programs, and an independent curator/art consultant. Come see the intuitive talent of Luanne E Witkowski as she reaches beyond the limits of the expected with the intentions of expanding the possibilities of outcome and reflection. Maison a Cape Cod by Daniel Brustlein, 1986, oil on canvas, 51 x 65". Artist Daniel 'Alain' Brustlein stands as proof that an artist's journey is forever ongoing. Since his death in 1996, Brustlein and his artwork have continued to make strides in the thematic disciplines of place and culture. ACME Fine Art believes in this, which is why they are hosting the gallery's first exhibition devoted solely to the paintings of Daniel Brustlein. To many, Brustlein is best known as the cartoonist whose cartoons appeared in the New Yorker in the 1930s, 1940s, and 1950s. Despite his fan base, Brustlein's true focus was always painting, where his elegance and grace as a painter still lives on. With his artwork, Brustlein tells the stories of his journeys as he paints with poetics, conveying mood and atmosphere in such a way that easily translates to his audience. It was not until 1955 that Brustlein was given his first solo exhibition, at none other than Stable Gallery in New York. His work was continuously exhibited in group and solo shows at the gallery for much of that decade. Brustlein's artwork has been featured in no fewer than twenty solo exhibitions in esteemed galleries in Europe and the United States. 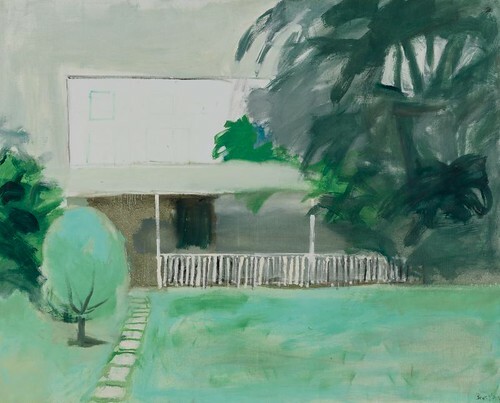 For the exhibition at ACME Fine Art, Gallery Director David Cowan has chosen a selection of fifteen landscape themed canvases dated between 1958 and 1986 that serve as a retrospective diary of the artist's infatuation with place. These paintings were all created en-plein-aire and they reflect some of Brustlein's greatest memories from his time spent in France, Italy, New York, North Africa, and Provincetown. Daniel Brustlein: Places will open at ACME Fine Art on Saturday, October 29th and will remain open until Friday, December 23rd. A reception to celebrate will be held on opening day from 2-4pm. If you'll be in the city before the holidays, make sure to stop by and see this show for yourself. The vivacity and realism of Brustlein's paintings will pleasantly surprise you, so much so that you might feel as if you're traveling his journey right alongside him. Located near Union Square in Somerville. Just a ten minute walk form Lechmere T stop. 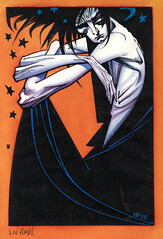 LitGraphic: The World of the Graphic Novel. Over 200 original artworks focusing on subjects such as the nature of relationships, the perils of war, and life's meaning. Discovery from the Air: Aerial Photography by William Garnett. Featured are sweeping pictures of forests, sand dunes, agricultural crops, the western terrain, and other dramatic American landscapes. This special exhibition juxtaposes African artwork with other art from different cultures revealing the similarities, differences, and an insightful lens for discovery. Pick up artscope magazine at any of hundreds of museum, gallery and university locations across New England!